From business to the education sector, everyone is investing a huge sum in video streaming. In recent surveys, it was concluded that around 52 percent of the universities use video streaming solution to educate their students online. Live Streaming is a powerful technology and is now serving schools, education centers, universities and more. Videos are considered extremely powerful and they also they pave way for real-time interactions. Choosing the right video streaming platform is important in video streaming. To help you select the right streaming platform, we have listed below the most popular ones. These video streaming platforms are beneficial for e-learning and also helps businesses interact globally. Facebook has been a leading social media platform ever since it was established. Mark Zuckerberg and Dustin Moskovitz have left no stones unturned since the time they established their social media platform. To engross the users, they introduced Facebook Live in 2015 across the globe. Millions of users find Facebook Live beneficial because it offers real-time event sharing which is painless and straightforward. Facebook’s live streaming software is very authoritative and it helps you connect with endless viewers in a very short duration. The biggest advantage we get with Facebook live videos is that they can be recaptured anytime even after they are stopped. With an option to comment live this video streaming platform is gaining a lot of popularity these days. Different businesses have different video streaming requirements and in order to fulfill them, Kaltura offers exceptional video streaming solutions. Kaltura is a powerful video management platform aimed at offering streaming solutions to universities, institutions, and more. Today, various organizations install and host Kaltura on their private servers. Apart from the private hostage, Kaltura provides cloud-based video service which is currently used by big ventures, universities, service sectors, and other service industries. Kaltura’s security includes encryption, DRM, and access control tools. It also offers video monetization with a variety of options. Video streaming services offered by Kaltura have a complete white label and the API offered by this platform is available for programmatic interactions. Striking out Wowza’s name from the best live streaming platforms would be wrong because of its exceptional video streaming services. Wowza is a famous platform for self-hosted streaming and cloud-based streaming services. Wowza streaming cloud aims at offering low-latency content access to audiences across the globe. With key features like Cloud management portal, Live stream recording, a range of security options, 4K streaming, APIs availability, it is one of the best live video streaming softwares across the globe. Netflix has gained a lot of popularity. With a plethora of options, it allows you to watch movies and TV shows. This platform is simple and easy to operate. People can simply create an account with Netflix and add different user profiles. With this facility of operating so many accounts on one platform, it becomes easier for household members to access their favorite series without paying any extra amount. The newly added live streaming service of Netflix allows viewers to participate in live exercise classes or watch cricket and other sports as and when they go live. LiveStream is also one of the most popular paid live streaming platform. It lets the customers upload live videos using their laptop or mobile cameras. Video streaming services with LiveStream was previously free of cost. But as it gained popularity, it started charging for its streaming solutions. LiveStream currently has 200 TV affiliates and is easier to use with World Economic Forum, Spotify, and more. Every smartphone user must have used YouTube once or twice in their life. Various video loggers are already making use of this platform by uploading their videos and going popular. The same platform is also available for live streaming since 2008. Live video streaming using smartphones was never as easier as it has gone with YouTube. The user-friendly features of YouTube, allows users to connect with their audiences in no time. The live video automatically gets uploaded on the channel so that viewers or subscribers can watch it later. 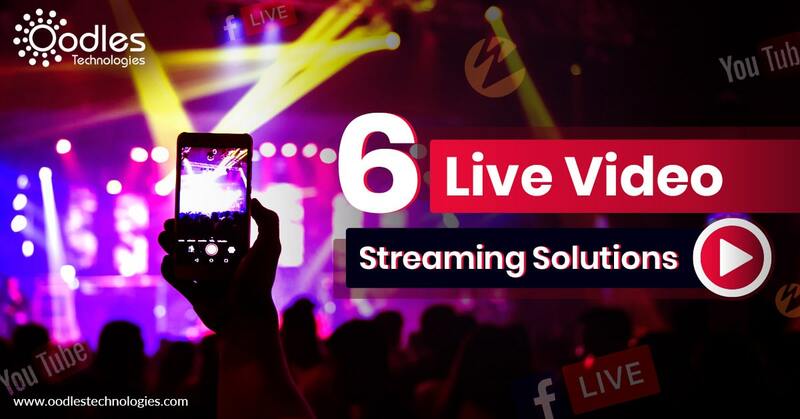 This platform also offers monetization through which the users will be able to experience best live video streaming everytime they go live. Are you having a hard time deciding the best live streaming platform for your business? Leave it on us. We, at Oodles Technologies, are one of the leading software development companies in India. We offer live streaming solutions, software development services and social media recognition to your business. Contact us now to get best web solutions!